This grown-up version of sweet-and-sour pork plays off the combination of black vinegar and ginger for its flavour. No pineapple required. 1. Slice the pork into one-centimetre-thin strips, and then slice each strip into four-centimetre lengths. Toss to coat in the cornflour and set aside. 2. Heat the vegetable oil in a wok or saucepan to 180C. Shallow-fry the eggplant in batches for about three minutes each, or until lightly browned. Drain well on kitchen paper. Shallow-fry the onion wedges for about two minutes until softened and brown around the edges. Drain well. Shallow-fry the pork in batches for about three minutes until lightly browned and cooked through. Drain well. 3. For the black vinegar sauce, combine the Shaoxing wine, soy sauce, vinegars, ginger juice, sugar and salt in a medium bowl, stirring to dissolve the sugar and salt. 4. Remove the oil from the wok and add the black vinegar sauce. Bring to a simmer over high heat and stir for about two minutes until glossy. 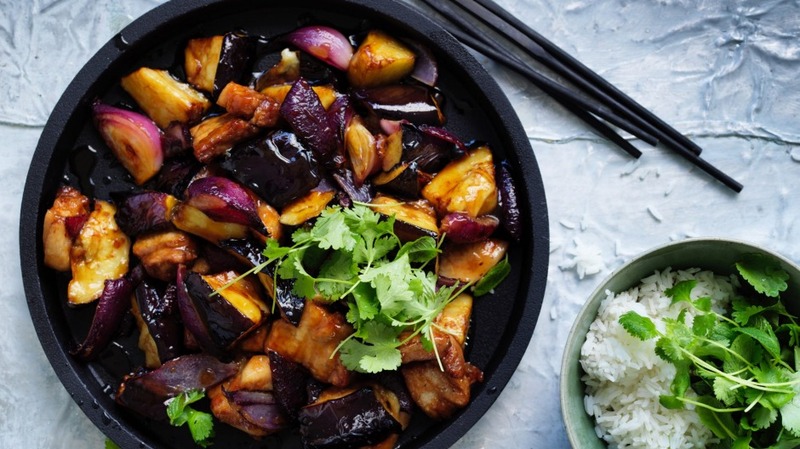 Return the pork, eggplant and onion to the wok and stir to coat with sauce. If the sauce is too thin, combine the extra cornflour with a little water and stir into the wok until the sauce is thickened, silky and sticking well to the other ingredients. Remove to a serving plate and serve with plenty of steamed rice. This recipe goes with Adam Liaw's garlic-pickled cucumbers.